Israeli students Linda and Ron, both former IDF soldiers. Ron wears a name tag from Rancho Buenavista High School in Vista, CA where the two made a presentation prior to an interview with San Diego Jewish World. SAN DIEGO – Two Israeli college students personally have felt the sting of the world’s prejudice against the citizens of the Jewish State. Under the auspices of StandWithUs, they currently are touring the southwestern United States speaking on high school and college campuses, and telling about their experiences. Because one is a former Olympian, whose athletic record easily can be found on the Internet, it is impossible to shield his identity, as has been StandWithUs’s usual practice over the 11 tours it has arranged for students who also are former soldiers in the Israel Defense Force. The current “Between the Lines: Voices from Israel” tour is an example of person-to-person diplomacy that gives former Israeli soldiers an opportunity to tell about their lives both in and out of the IDF. The former Olympian’s name is Ron Darmon and he was Israel’s first-ever competitor in the triathlon event of the Olympics. He placed 26th in a field of 55 participants, who swam, ran and bicycled at the 2016 games in Rio de Janeiro. The other student shall simply be identified as Linda. Like Ron, she also was a former soldier in the IDF. While Ron was a physical fitness instructor, Linda served as a social welfare officer, many of whose clients were Lone Soldiers, who came from distant lands, without their parents, to volunteer for Israel. With the rank of a lieutenant, Linda made certain that they had places to go on the Jewish holidays, that they had host families with whom they could celebrate the Shabbat, and that when they were lonely, or homesick, they had someone with whom they could talk. 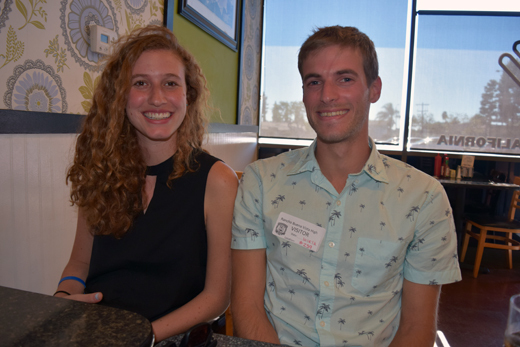 In presentations at local schools, Ron and Linda spoke briefly about their former jobs in the IDF, but found that California students more often were interested to learn what day-to-day life in Israel was like, asking such question as what is the climate, and whether they had ever come under rocket attack. But even more so, the American students were interested in Ron’s and Linda’s personal biographies, and the burdens young people can be subjected to just because they are Israelis. The Turkish games came during a time when Israel was at war with Gaza, and feelings against Israel in Muslim countries like Turkey were running high. To understand how Ron felt, imagine yourself representing the United States in a major race. Only when you received your medal, there would be no acknowledgment of the U.S.A., no playing of the Star-Spangled Banner, just a quick, almost furtive, grudging presentation of the medal. Hardly the moment young athletes dream about. Ron said the moment was transformative for him because from that point on, he changed his focus. Yes, he still was an athlete, as qualifying for the 2016 Olympics proved, but he had another cause. That was to stand up for Israel, and to stand against extremism in all its forms. He said that for the most part he has found that other international athletes are often more tolerant than their governments. “Athletes accept each other,” he said. An international competition “is a place where everybody comes together, so when politics are involved, the athletes combine together against it.” Unfortunately for Ron, he suffered a head injury in a bicycling accident that caused memory loss and reflex issues, probably putting an end to competitive racing. Eventually, her Venezuelan passport expired, and with no diplomatic relations between Israel and Venezuela, she is unable to travel to the land of her birth to visit those relatives and friends. She said she won’t be permitted to enter Venezuela on her Israeli passport. Had the situation been otherwise, it would have been relatively easy for Linda, now on tour in North America, to fly afterwards to the South American continent for a reunion with her loved ones. Ron was less certain about his future, calling it the “million-dollar question” and one which his parents frequently pose to him. Ron, newly married, has been studying business and economics at the Open University in Tel Aviv, but at this point is not certain what direction that will take him. I asked if they could impart just one or two ideas to listeners, what would they be. Harrison is editor of San Diego Jewish World. He may be contacted via [email protected] San Diego Jewish World, along with The Moderate Voice, is a member of the San Diego Online News Association. This article is reprinted from San Diego Jewish World.